VA Dentist Puts Hundreds of Veterans at Risk for Infection | Hupy and Abraham, S.C. Dental Facility May Have Exposed Patients to HIV The Tomah VA Dental Facility may have exposed patients to HIV, Hepatitis B and Hepatitis C between October 2015 and October 2016. A dentist at the Veterans Affairs Medical Center in Tomah, Wisconsin is under investigation for violating the VA’s dental equipment protocol. As a result, nearly 600 veterans could have been infected with HIV, hepatitis B or hepatitis C.
The dentist was trained to use the facility’s sterile, disposable equipment. According the VA’s director, he used his own equipment, cleaned it and reused it. Violations came to light when someone filling in for his assistant noticed what was going on and reported it. As the investigation continues, all of the veterans who were treated have been advised to get tested for possible infections. The dentist, who remains unidentified, has recently resigned and was previously working at the facility since October 2015. Those who received treatment during that time frame should immediately call Hupy and Abraham at (800) 800-5678. 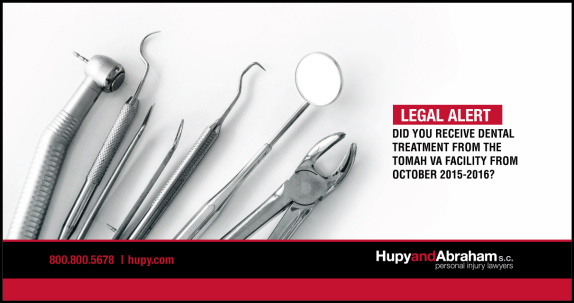 Hupy and Abraham is representing everyone who received dental treatment at the Tomah VA from October 2015-2016. If an infection occurred, you may be entitled to compensation for treatment, as well as pain and suffering. If an infection did not occur, you may be entitled to compensation to cover the cost of the necessary tests and emotional distress.